CAN YOU HELP ME OUT? I’m trying to decide on which tomatoes to grow this summer. I’ll certainly include some of the heirlooms which have performed well for me in the past. But what else am I missing? Talk to me about your own favorite heirlooms and hybrids. Cherokee Purple. I love this dusty rose-toned fruit. It offers a deep, acidic taste and extreme juiciness. It’s my favorite variety for succulent tomato sandwiches. 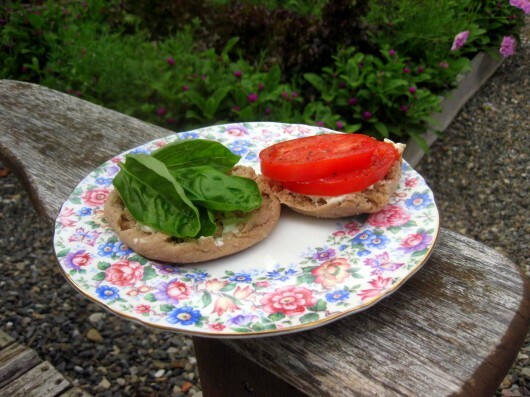 My version of a succulent tomato sandwich: thickly-sliced tomatoes, salt, pepper, basil leaves and mayo on a homemade English muffin. Don’t pretend you didn’t notice the plate in the above photograph. I purchased this floral horror several years ago at a junk-tique shop. What was I thinking? Probably I’ve just insulted someone’s cherished china pattern. Rose. A large and meaty heirloom (similar to Brandywine) from the Amish in Pennsylvania. Terrific for Tomato Pie. The tomato pie in question. It’s too delicious for words. Here’s the recipe. Striped Cavern. A beautiful heirloom, with yellow-striped orange skin. The interior, as you can see, is mostly hollow, except for a few easily-removed seeds. 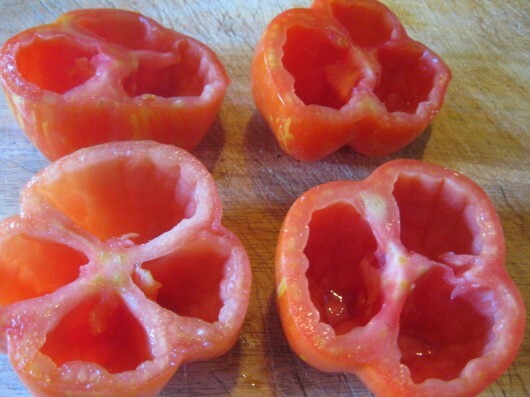 And what can you do with hollow tomatoes? Well, you can stuff them! My favorite stuffing is a mixture of parsley, garlic and breadcrumbs, all drizzled with olive oil, and topped with a little cheese. Roma. Like all “paste” tomatoes, this variety is low on juice, and high on meat. Thus it is ideal for saucing. Roma has always performed well in my Hudson Valley garden. Amish Paste. In my experience, this one is even more prolific than Roma. It’s the long, skinny fruit in the basket you see pictured above. And here is a newbie for me: ‘Theuret Brandywine.’ Reader Judy Hines sent me seeds of this variety. It’s an heirloom tomato that her neighbors have grown for generations. 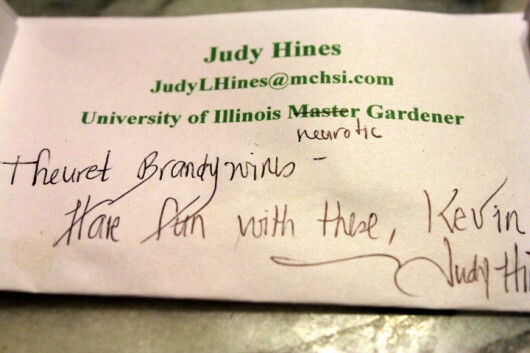 She sent seeds to Seed Savers Exchange, too, for the sake of posterity. Good for her. In the comments field below, I hope you’ll talk about your own favorite tomatoes. You might even mention some of the newbies you’re planning to try this summer. This year’s anticipated tomatoes are Tomosa, Legend, Indigo Apple and Perfect Rogue. Legend provides early and very prolific standard sized tomatoes with good flavor here in the PNW. 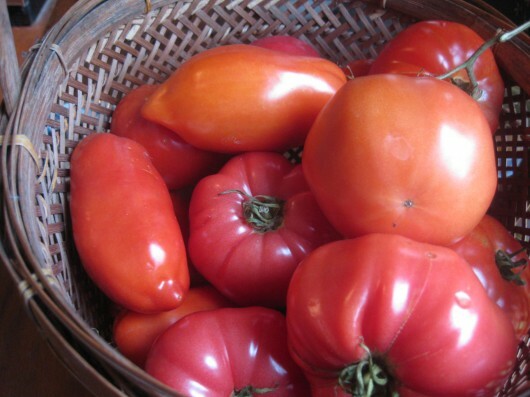 Tomosa is a salad tomato that produces amazingly uniform fruit on large trusses (6-8 to a stem) and is a neighborhood favorite. I have several people here in town who ask every year when they’ll be ready. I give away tons of these! Indigo Apple is a new variety that I found from Territorial Seed. It’s a cherry tomato and is supposed to mature to a purple color! Sounded intriguing so it gets a spot instead of our usual Sweet Million. Perfect Rogue is an open pollinated variety bred back from a commercial hybrid here in Oregon by local seedsmen. It’s supposed to be an early slicing variety. Offered by Adaptive Seeds, a local, small seed company. I’m looking forward to that first tomato, Kevin! This year I am trying Pink Brandywine (hope it is as good as the red. I ran out of the red seed and the seller I ordered from only had pink). Also, excited to try Black from Tula , which will be my first black tomato. I still have leftover seed of Green Zebra and Sweet Million so will plant those too. I’m starting Ox Heart tomatoe seeds this week in Butler PA.
Kevin, I read your blog regularly and have tried many of your recipes with great success, so here are my choices for tomatoes. 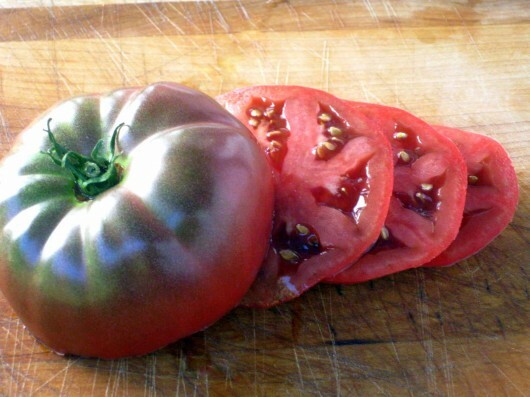 I have grown Cherokee Purple but a couple of years ago I tried Black Giant and now prefer it for a dark tomato. Last year I also grew Hillbilly which is an orange and red mottled, delicious tom. Another one I will be growing this year is Dr. Wyche’s Yellow and for cherry tomatoes I will have Sungold and Tom’s Wild Cherry. If you want a great site for heirloom tomatoes go to http://www.terraedibles.ca. They have a very extensive list which makes it very hard to limit your choice to just a half dozen. Ramapo! 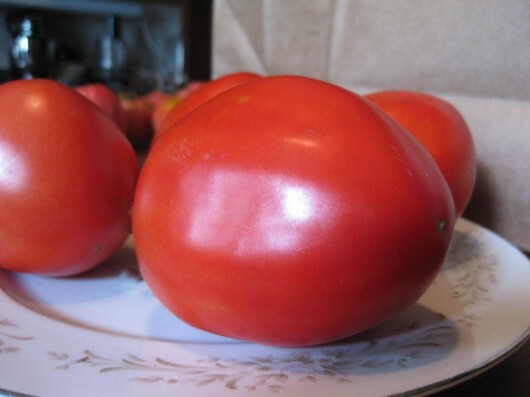 I think they are the most delicious tomatoes, they are well balanced in flavor and never mushy. I grow grape, yellow pear and Sweet 100 tomatoes–just the little ones. Since I use them mostly in pasta and salad dishes, little ones are “pre-chopped” so to speak and save me time. Also, if a bug or other critter takes a bite, I’ve only lost a tiny part of my harvest. And most importantly, my little furry co-gardener dog has learned to carefully select and bite off his own ripe tomato without my help. Green Zebra – great flavour, low acid and smashing good looks. Love Persimmon on a BLT, green zebra out of hand, so refreshing. One of my favorite tomatoes is “sweet baby girl” so prolific. I love to eat them right of the vine. Because there are so many I cut them in half and dry them in the dehydrator . These are then vacuum sealed into 2 cup packages. Great for snacking, using in spaghetti sauce, roasts and anything else you can think of. Ground up in the food processor it’s great in my whole wheat bread recipe or put in a shaker I use it as a seasoning. I am a big fan of ‘Rose’, almost an evangelist for it! I have friends that EXPECT seedlings for their gardens from my starts. To my taste, this is a tomato that is slightly less tangy, perhaps slightly sweeter than Brandywine, full of tomato flavor, but…smoother, somehow The fruits are well-formed, and have few seeds. I get my seeds from Johnny’s. The most prolific and tastiest grape sized tomato I have ever grown and will always grow is the heirloom Matt’s Wild. It has won taste testing contests in my area at a large farmers market and has a natural resistance to both early and late blight. It produced tomatoes to pick every other day from mid July to frost and the only pest or disease I dealt with was tomato horn worm which was a pick off(with gloves) and smash project for a couple weeks in late August. They have a yummy flavor with a slight tartness that make them my favorite snack while working in the garden. I wold love to try some of these! I am just hoping, however to avoid late blight this year. Last year was the first year almost,everything was in raised beds, and one 12 ft. bed was devoted to three tomato plants. Unfortnately last August, whe we came back from a one week vacation, my formerly lush green tomatoes were all dying. I was able to harvest a paltry amount of us damaged tomatoes, but the rest got put into the burn pile. Will be planting in a different bed this year and hoping for the best. I have heard there are blight resistant varieties, and I am guessing none of them are heirlooms, but hybrids instead. Last year was my first garden and I did the Roma tomato as well as the Amish Paste tomato. I also did a Brandywine but it didn’t produce much. The yellow pear was amazing and I fed 4 neighbors plus ourselves just from it alone. I am taking the Master Gardener Course here in Indiana and they are all raving about ” Celebrity” as a great tasting tomato with lots of tomatoes so I am on the hunt to find these seeds locally if possible. Always ready for another tomato in the garden. Yesterday I sat outside in the nice warm sunshine and today we are supposed to get S–W again. Just don’t even want to write the word anymore so I hope this is the last one! So ready for spring. The lady giving the talk on vegetables this week told everyone that the leaves you put on your garden in the fall are “pure gold” and she doesn’t even use fertilizer at all, just as many leaves as she can get on her garden each fall. Well, I was feeling proud as I read that on your blog and did what you said and have tons of leaves on my 10 beds. Thanks again for a great tip. Also learned that our local government will bring me a truckload of chips for the pathways and a truck load of leaves in the fall as they have to pay to get rid of them. Never thought about asking them to dump them in my yard and it is supposed to be free. Not a bad idea. Enjoy your blog and recipes. Made the tomato pie last summer and everyone loved it as well as the cheese sticks that I have made several times. Always a winner. Sub-Artic Plenty tomatoes are my recommendation. They were, allegedly, produced in the 1940s by the US military to provide fresh tomatoes to the troops in Greenland. They are a determinate type and grow very nicely in pots rendering the first tomatoes of the season here in Cleveland. 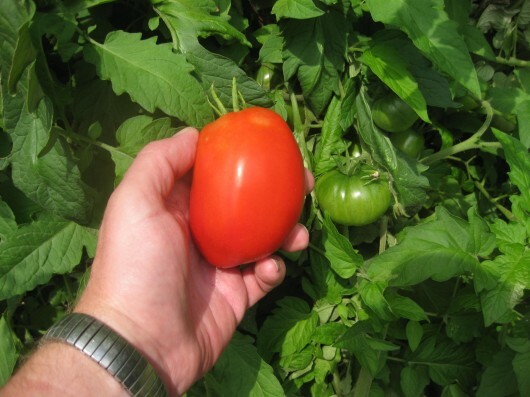 Plants grow to about 36″ (no stake required) and tomatoes are about 2″ red and tart. My seedlings are 3″ right now and ready to begin hardening up next week. I have to agree with Marjean : Tomosa is amazing and among my favorites… a most generous (and beautiful) plant. Also trying this year a couple of heirloom, Bonny Best and Martha Living… coming back to old ‘Celebrity’ and doing the regulars, Super Sweet 100, Hybrid Cupcake (pink) and Big Beef hybrid. I wish I had seen your website before we built our green house and started seeds. The milk jug method sounds so easy and cheap! Is it too late to try starting something this year? I have purchased, unfortuately not grown, these beauties at Wegmans. Also available at Trader Joe’s. So wish you lived within walking distance. Kevin you are awesome!!! For the last several years, I have planted ‘Black Krim’ ,’Chocolate Cherry’, and ‘Mr. Stripey’. They are all very sweet and flavorful. ‘Black Krim’ is a medium sized tomato, ‘Chocolate Cherry’ is small but larger than most cherry types, and ‘Mr. Stripey’ is fairly large and yellow and pink striped. They are all indeterminate. bearing into the fall in my zone 7 garden in N.C. You might give them a try. I loved the pineapple tomatoes grown from plants bought in Lancaster. Found some plants at a nursery in Glens Falls a few years ago- just a wonderful as remembered. Havebe’t gardened for a few years, but will this year. I am seriously craving Spring! The birds are staking out their nesting sites, and chipmunks are darting around so Spring must be coming- Soon? How to decide! I’ve got into heirlooms and now grow about 25heirlooms. I’ve slowly converted half the gardening neighbour hood and garden club to them as I grow more plants than I can use and harvest more tomatoes than we can use. My favourites tend to be the blacks, large and small. Brandywine doesn’t do well here in the mtns. Nights too cool. This year I bought TheWhole Seed Catalogue from Baker Creek heirloom seeds and am drooling over the photos. Black Plum is my favorite small. Now I must go and pot up tomato seedlings under the lights. I plant only heirlooms. My favorites are Black Krim and Mortgage Lifter. Black Krim has a wonderful rich flavor, and Mortgage Lifter produces and cans well. Just thinking about them makes my mouth water! I always have Roma in my garden but I really enjoy growing and eating the Green Zebra and a new one I grew last year and was a huge success with EVERYONE is the Organic Black Cherry Tomato. It has so much flavor like nothing I have ever had before. It’s a must try for you and a repeat for me. I try a one new tomato and one new herb or veggie plant every year and see if I like the taste and what I can do with it before I decide if it becomes a mainstay in my garden. I grew up with Grandparents that were farmers and I spend most of my time with Grandma in the summers and after school. We would always plant, eat, harvest/can Kentucky Wonder and Blue Lake green beans but a few years ago I tried the yard long green bean and it taste great, better yield and I can make the same things with yard long as I can with the other two. The yard long is such a beautiful plant and great for the pollinators. Enjoy! Black Prince, Black Prince, Black Prince! I can’t say enough good things about this wonderful heirloom variety. It is hands down the most flavorful tomato I have ever eaten. I shared a few with friends and family last season and they were so impressed that they saved seeds to grow their own. They take some time to ripen,but are well worth the wait. They are easy to grow though and quite prolific. I adore the yellow cherry Sun Gold for its long growing season, resistance to blights and its flavor. The crop is non-stop. I placed two seedlings into a (foldable for storage)Texas Tomato Cage and they burst out the top in no time and draped over all sides. I did prune them, reluctantly. Their downfall is a tendency to crack, but the sheer numbers make that problem negligible. The second choice is a recent discovery – Red Calabash. It’s a Mexican heirloom that is small, squat, wrinkly and cute. It also bears earlier than many others I’ve grown. The best aspect, though, about Red Calabash is the way it reddens so fast that the birds don’t ruin it before I am picking it. A good attribute. Flavor is delicious. Insides are really red and look great in salads. The third choice is a Yugoslavian Heirloom whose seeds came from an elderly Slovak acquaintance MANY years ago, and he is still around! He has no other name for these tomatoes but “Yugoslavian”. Despite my efforts to locate a similar tomato in the nursery trade, I can find no other large pointy bottomed, fire engine red, meaty specimen that matches Yugoslavian. Gorgeous and delicious. I plan to start my tomato seedlings about the 10th of April or so, near tax time annually. My new choice for 2014 is German Johnson. There will be about 8 varieties growing here in my back yard. Love reading ALL these posts. Like J Spindler, we have issues with early blight and septoria leaf spot. Heirlooms are hit worse than hybrids…so sadly we grow few heirlooms. our garden is fenced for deer so our crop rotation is a bit like one of the kids puzzles where the pieces do not come out, you just switch them around. Sun Gold is resistant and Early Girls do ok. Mountain Magic are bigger than cherry and smaller than typical but survive anything that comes at them fungal wise. I also dig out the planting hole each spring (pretty large) and replace with Organic Mechanics compost and potting soil to limit the amount of exposure to already spore infected soil. It helps til the airborne fungus sets in. OH and a dozen crushed eggshells in each to prevent blossom end rot! What we go thru for fresh veggies!! I have had great success with Mortgage Lifter – very prolific and tasty to boot. Can’t WAIT to try this pie!!!! Down here in the South……Northwest Florida……we plant Celebrity Hybrid……they work good for us. 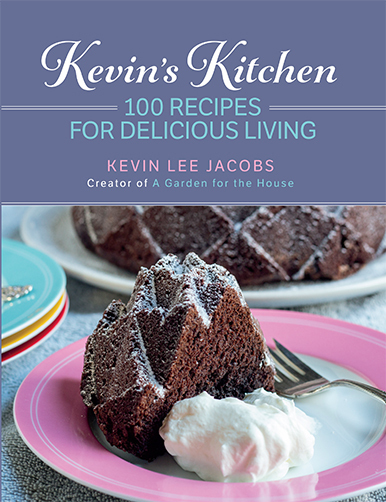 Hi Kevin ~ love your pictures and can’t wait to get planting. Hope Zone 5 warms up pretty soon! My favorites are Costoluto Genovese/Ugly, Brandywine ~ even though mine always have “cat facing”, German Green which has a spicy taste to it, and Yellow Pear cherry tomatoes that are like eating a wonderful candy and you can’t stop…. In another week I’ll start planting seeds. I’m have grow lights, but purchased heating mats this year to try and get better root systems of the seedlings. I hope we all have a wonderful growing season this year…..last year was so wet in New England! If you want a beautiful little yellow cherry tomato, you can’t go wrong with the Ildi heirloom. My grandkids love them as garden snacks and they are so pretty in salads and pastas. My friends are all looking forward to their plants I start for them each year. I’m really enjoying this post. Lot’s of new ideas. I’m a Roma only kind of gal. I use them for my salsa, on sandwiches, in salads and if I need a quick stewed tomato. I guess I just don’t like tomato juice running down my arm when eating a sandwich. Don’t forget the tomatillo – not sure if it’s really considered a tomato but it’s used in my salsa and makes that ever popular salsa verde. I grow black krim, brandywine, celebrity, mortgage lifter and I am trying out Umberto and two heirlooms one is pink and the other is red with black spots as the seed seeds were given to me by a friend and the friends got the seed from her friend and there is no name to the seeds..
How many tomato plants do you grow? I put out 50 plus plants last year. I could not bear to throw away any of the plants that I grew from seed. Saw someone above with the same answer,Morgage Lifter and a Black called Black Crim…It grew twice as fast, forgot and left the babies out when it was really to cool, no problem…wet year…again no problem. The Crims were a foot tall when the others were 5″ tall and was one of the most dark red delicious tomatos ever. The Morgage Lifter’s are a large Beefsteak that out produce any of the others. Also relly like Pineapple tomatos and a Green variety called Aunt Ida’s Green. All those and a tiny cherry tomato called, Wild Cherry[tiny and lot’s of flavor] will fill out my garden this year. Last year was the first year I had a garden and I grew a Roma and a Genovese. I planted basil next to each. The Genovese looked beautiful but the taste was like cardboard. The Roma was so good that workers and my house were picking them off the plant and eating them raw. One plant produced so many tomatoes that I could not use them up quick enough. I saved seeds from that plant and will be planting it again this year. It made a hearty tomato sauce for pizza and cooked down well to make tomato soup. Have you tried Black Cherry, Juliet, Yellow Pear or Sun Gold? All are small but produce huge plants even if all suckers are removed. Each will produce a few tomatoes every day, enough for a salad for two. tomatofest.com is a great site for tomatoes. Over 600 heirloom varieties. I’m trying Lidi, Hawaiian Currant, Matt’s Wild, Lollipop and Black Cherry. I would not be without Juliet. It is a grape tomatio, enormously productive, keeps well on the kitchen counter, does not get spots, rot or get mushy, but may get a little wrinkled by January, It is meaty, somewhat like Roma but much tastier. Another good keeper is Indigo Rose. It is black like eggplant and very shiney, looks beautiful with sungold and sweet million in a mixed tomato dish. But my best tip is how I keep them, discovered after years of peeling them with scalded fingers and juice running down my arms, or boring and messy pushing them through a food mill. Now I just wash them and put them in a plastic bag and pop them into the freezer. They do not stick together–I can take out just the amount I want. Then hold them under the warm tap for an instant and the skin slips right off. They are then still frozen and can easily be sliced or chopped with no juicy mess. Or dump them whole into soup. stir fry, spaghetti sauce or chili. So easy. I also try a new tomato every year, last year it was Indigo Rose and this year I’ve started some Paul Robeson seeds after tracking them down. My mainstays are Purple Cherokee for slicing and Yellow Pear to snack on. Kevin: I follow a few gardening blogs and everyone is talking tomatoes. I can’t wait for spring to arrive. They have a lot of wonderful information on their blog. I am sure you will enjoy it. 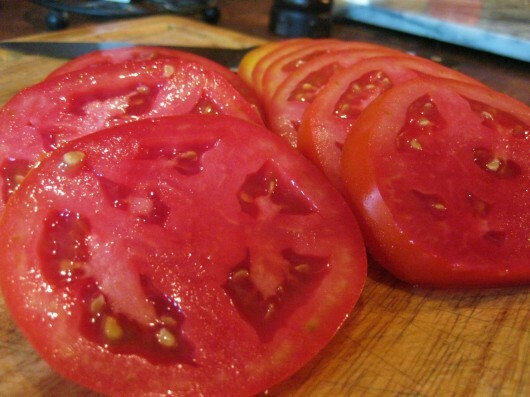 We grew Brandywine last year and only got one tomato…but it was one delicious tomato! We live in SC on a small lake so our soil can be too wet, especially with all the rain we had last summer. This year, we more than doubled the size of our garden and I ordered seeds from Diane’s Seeds and Renee’s Garden (on your suggestion). We added lots of peat moss and sand to our soil before tilling so hopefully that will be a good solution. My seedlings are looking wonderful in their milk carton houses right now and we’ll probably be transplanting them into the garden next week. For regular tomatoes, I am growing Cherokee Purple, Stupice, Sunset’s Red Horizon, Brandywine, Roma and for cherry tomato: Peacevine Cherry and Sweet 100. I’ll keep you posted. I also tried Santa Grape tomatoes last year-tons of fruit. I even won a ribbon at the fair. I also had these amazing heirloom tomatoes in the fall from a pumpkin farmer but the hired guy who picked them didn’t know the name. Huge juicy, just dash of salt . . .. they were pink and orangey and oddly shaped. They also had amazing popcorn. . . the year before’s crop dried and ready to go. Cherokee Purple is 1st, Black Krim is big and wonderful. Both are a must for me. Thanks for the beautiful tomato pictures. . I tried Beaver lodge last year for the first time and i was very impressed. 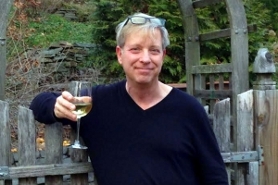 i am in the pac nw and i love old germans but they need lots of time and i am not always able to get them going. if you can extend your growing time w/ hoop house give them a try. Brown Berry is a large cherry tomato. Love the complex flavor, and it produces like mad! I tried a bunch of heirlooms last year for the first time and the only ones that thrived were brown berry and black Krim. Juliet is my go-to tomato. I do everything with them. Not too juicy- not dry- just right. Of course, I also grow Brandywine, Cherokee Purple, Mr. Stripey, Yellow Pear, Green Zebra, Rutgers and about 27 others in total. May I submit to you the Bourghese Tomato? We grew these up here in the Finger Lakes last year and I fell in love. 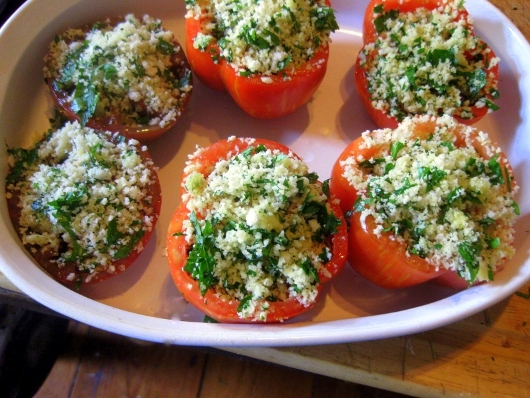 Understand, that in all of my 38 years I have NEVER found a tomato I would eat raw….and then, these came into my life! Amazing. They are smaller than a Roma and bigger than a Grape tomato. They are meaty and have thick juice. They say they are great as sundried tomatoes…. and they made amazing sauce. Love them! How is one to decide on a favorite tomato? I love all of them. However, here are the standouts. Kellogg’s Breakfast, purchased many years ago as a seedling thinking it was a red tomato. It is a huge yellow-orange late, fabulous tomato which now is a required one on our garden. Others include: Chocolate Stripes, Paul Robeson, Mr Stripey, Black Icicle, Opalka, Black Cherry, Belgium Giant. I could go on for pages. I try to plant ones I grow from non-GMO seeds which I have raised organically. I don’t knowingly raise hybrids, much preferring the overwhelming flavor of the heirlooms. Can’t wait to plant, just wish I had more room. Happy Gardening to all. Oh, get the Baker Creek seed catalog form http://www.rareseeds.com. It is a fascinating, beautiful catalog with a huge variety of seeds from around the world. New this year: Black from Tula. My favorites are Cherokee Purple, Black Krim, Green Zebra and Indigo Rose. I hope do better this year than last year. Someone else mention Mr. stripey, I love that variety also. Looking forward to some homegrown tomatoes this year! I adore Brandywine tomatoes and grow a few plants each summer. The Costaluto Genvese tomato is another favorite (http://www.growitalian.com/products/Tomato-Costuluto-Genovese-sel-Valente.html), it has a wonderful flavor and performs well. Early Girl is another good classic, as well as Super Sweet 100. Can’t wait for the season to burst! I can never decide which tomato I like the best. So I am trying a bunch of new different ones every year. This year it is going to be the Cherokee Purple and Black Cherry. My oldest grandson loves the Snow White Cherry, so I have to grow these again for him. He also wants to try the Geranium Kiss and for me Siletz and Indigo Rose from Nichols Garden Nursery. Maybe one year I find one Tomato, where I’ll say, this is the best one for me. Big Boy and Costoluto Genovese (my ugly tomato) came close one year. And for me it is definitely the “Joan Crawford approved Tomato Trellis”. Have to try your Tomato Pie and stuffed Tomatoes. Bet they are delicious, like all your recipes. The best Roma type is Opalka. All the seed catalogs rate it very highly. I have had tomatoes that were bigger than a pint jar. Very meaty, few seeds ans make wonderful sauces and salsas. Black krim is a keeper as well as Blondkopfchen for a very sweet yellow cherry. Grow others but these are my must haves. If you haven’t tried Siletz, you might want to. They are my husband’s favorite! Arkansas Travelers are good, too! Pineapple tomatoes are absolutely amazing, as are Black Krim. 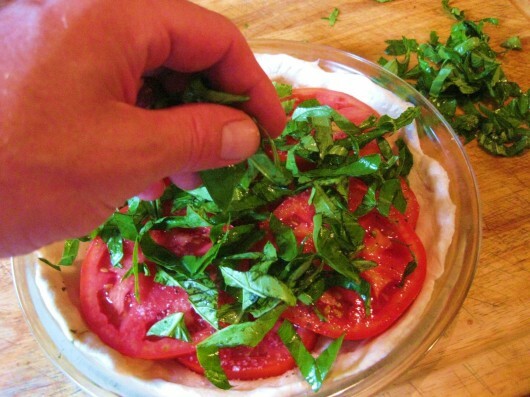 When it comes to cooking, Bolseno tomatoes are my hands-down favorite. The vines were nearly 10′ long last year, and loaded with tomatoes, in the heat & humidity of the average Mississippi summer. I’ve grown Celebrity always–my favorite for tomato-vegetable juice and slicing. I used to grow Roma’s but have found they do not compare in production, plant hardiness or taste to Marzano or Super Marzano. These are bigger, healthier and more prolific than any Roma I’ve ever grown. Black Prince. That one was prolific for both my mother and me. We live one zone apart. A Roma style tomato called “Hard Rock” is a wonderful determinate variety. All fruits are easily 2″ diameter and 3″ long. I had five plants and when a frost threatened in the fall, I picked them all – 173 to be exact. A great cherry is “Chocolate Cherry”. When ripe these large cherry tomatoes ( 3/4″ – 1″ diameter) are brownish with a pink blush. It doesn’t sound appetizing, but they are very sweet and wonderful. It’s hard to not eat these right off the plant when harvesting. I plant Mortgage Lifter and Roma I pick, wash and freeze them in vacuum sealed packages. (no cooking or blanching) I think I still have a couple left in the freezer…time for some good sauce! Try Eva’s Purple Ball – not purple at all but lovely. And for fun, Goldman’s Italian. One thing I found with canning tomatoes is that the dark ones don’t look so great when canned – maybe it’s just me – but they look “iffy” in the jar. So I stick with the reds, yellows, and pinks. My favorites are Green Zebra and Tye-Dye Hybrid (orange/yellow) and Principe Borghese (larger cherry tomato, perfect for salads and for sun-dried tomatoes). We’re all thinking of summer, I guess. But first, perfecting the St. Patty’s day corned beef (a little more whiskey to go in the broth, then the cabbage and potatoes!). Anyway, here’s our favorite tomatoes–Favorite Heirloom: Indian Moon (beautiful orange). Favorite Hybrid: Green Zebra. My favorites: Neves Azorean Red, Mexico, Hillbilly, Virginia Sweets, Persimmon, Marianna’s Peace for big tomatoes good for sandwiches or salad. Black Cherry and Blondkopfchen for nibbling and roasting. Opalka and Jersey Giant for paste tomatoes. Never had luck in my suburban Chicago garden with Brandywine tried a variety of strains, also San Marzano was a bust. Julia Child and Elbe just didn’t enjoy my garden; both tasty but never really got much production from either. Always had great, consistent results from Amish Paste, Jetsetter and Big Beef but only 12 spots in the garden for tomatoes so some must go so I can try new ones . New this year are Azoychka, Paul Robeson, Caspian Pink. Favorite tomato seed sources are Territorial and TomatoFest, the latter , with all their glorious pictures and descriptions, is heaven on a cold winter day. It’s so hard to pick a favorite, but these are the kinds I grow when I have the garden space for them: Brandywine and Green Zebra, Striped Roman – meaty but flavorful, perfect for pizzas, Isis Candy, Sungold, Black Cherry and Green Grape for cherry tomatoes, yellow pear for color and shape, and red currant or spoon tomatoes – so cute and a blast of tomato flavor without lots of chopping. I always have Roma tomatoes. They are the best for sauce, salsa, and just plain canning. When my back is cooperating, I try to put up 60-75 quarts a year of tomatoes, sauce and salsa as I have enough left. Giant Belgium is one of my most favorites and I save seeds every year. Mr. Stripey, a lovely yellow with red stripes. One slice makes a sandwich! We also like Striped Roman and Green Zebra, what is it wth the stripes? Finally, one of our new favorites is Franchi seed that we got through Seeds from Italy, it’s just called Red Pear. It isn’t a little tomato like yellow pear, it’s a larger tomato that is shaped like a purse. Awesome! Cherokee and Yellow Pear are my favorites and grow very well in our Ventura CA summers! Cuore di Bue… Looks like a pouch. It went on and on all summer with big, juicy indeterminate lovelies. Juliet (recommended by Margaret Roach) was my happiest discovery last year. What a versatile tomato! It handled some late late blight pretty well, too. My other favorites are from the Hudson Valley Seed Library: New Yorker, and Fox Cherry. The New Yorker is a good salad tomato, and Fox Cherry just goes and goes and goes. Last year I was still using up old Better Boy and Brandy Boy seeds, though I suppose I may not replace them now that Monsanto or some other evil empire owns them. I tried a new and very expensive Iron Lady seed that promised to be blight-resistant and I was greatly disappointed by both the taste and texture of the tomatoes and the disease resistance (though one of the eight plants was far superior to the others so perhaps the vendor just did a really terrible job of stabilizing their seed). That will teach me to always trial a new variety carefully. Sadly, this year I’m moving and thus not starting tomatoes for the first time in 11 years. Maybe I’ll land in a place where I can squeeze in a late crop. Good luck with yours. Roma, Amish Paste, and Royal Chico. They make the best sauce. My germination this year was great. I’m going to have plants to share with family and friends. Two little salad tomatoes I love are Sweet Cherry 100 and Yellow Pear. A terrific beefsteak tomato is Russian Black.One year I didn’t pull up my Sweet Cherry 100 vine and it came back (and tried to take over the neighborhood after it grew over my arbor & fence!! Anna Russian is my current favorite for eating off the vine. Pinkish, heart shaped and delicious. Striped roma was our best producer last year. Tasty in sauces and wonderful eating. Black cherry wowed me last year. Right up there with sun gold for grazing. Green zebra surprised me with it’s sweetness and firmness. Looking forward to seeing what you grow. I mostly like the dark purple or orange varieties. Fourth of July or Early Girl for early tomatoes because I can’t wait to eat them; three varieties of cherry tomatoes (red, orange, yellow) which I eat like candy; Brandywine; and San Marzano Roma tomatoes are the plants I like to have in my garden every summer. Each variety has it’s unique uses. I normally buy plants in May because I never had much success starting them from seeds. But, after reading Kevin’s method of planting seeds, I will start my Fourth of July seeds in 1/2 gallon milk bottles in a couple of weeks. I grow only heirlooms tomatoes too, they have such wonderful flavor they are worth the extra trouble you have to take to grow them, i start my own seedlings every year and always try a few new ones. My favorites to date have been black krim and mortgage lifters, and also amys apricot cherry tomatoes, this year new ones i am trying are black&brown boar, and purple dog creek, i admit i was drawn to the names! Happy growing everyone. orange. I have not seen any seeds, packets that color, I have been looking. Loved having a BELT for breakfast all summer. I keep looking and hope to find some more plants, will save seeds this time. Great white and pineapple! Those were my favorites last year.